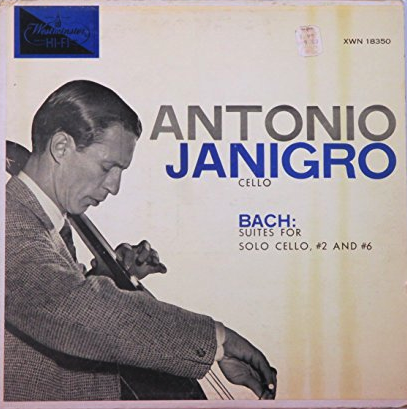 Antonio Janigro, the great Italian cellist, was born on January 21, 1918, in the via Guido d’Arezzo in Milan. Janigro said of himself in a 1988 interview with Oreste Bossini: “I was born into a musical, yet tragic, atmosphere. My father had wanted to be a concert pianist, but had lost his left arm to a sharpshooter in a war. Janigro studied piano first, starting at the age of six, and then began playing the cello in 1926, when he was eight years old. He was given a cello at that time by Giovanni Berti, who also gave him his first lessons. He fell in love with the cello immediately. In less than a year he had progressed enough to be admitted to the Verdi Conservatory in Milan, where he studied cello with Gilberto Crepax. Janigro waited until 1934, when he was sixteen years old, and then moved to study at the Ecole Normale. Along with Casals and Alexanian, he came into contact with other great cellists and musicians: Cortot, Thibaud, Paul Dukas, Nadia Boulanger, Stravinsky and others. Dinu Lipatti and Genette Neveu were his fellow students. He began a solo career immediately upon graduation (1937), playing in recitals with Dinu Lipatti and Paul Badura-Skoda, the gifted pianist. He often traveled back and forth between Milan and Paris on the railway, and would search for an empty compartment in which to practice his cello. Once while practicing on the train, the door to his compartment opened, and a music agent appeared, and later organized concerts for the gifted young cellist in France. Janigro was an elegant dresser, and constant cigarette smoker. After the war he resumed his international career as a soloist, and traveled extensively in South America and the far East.